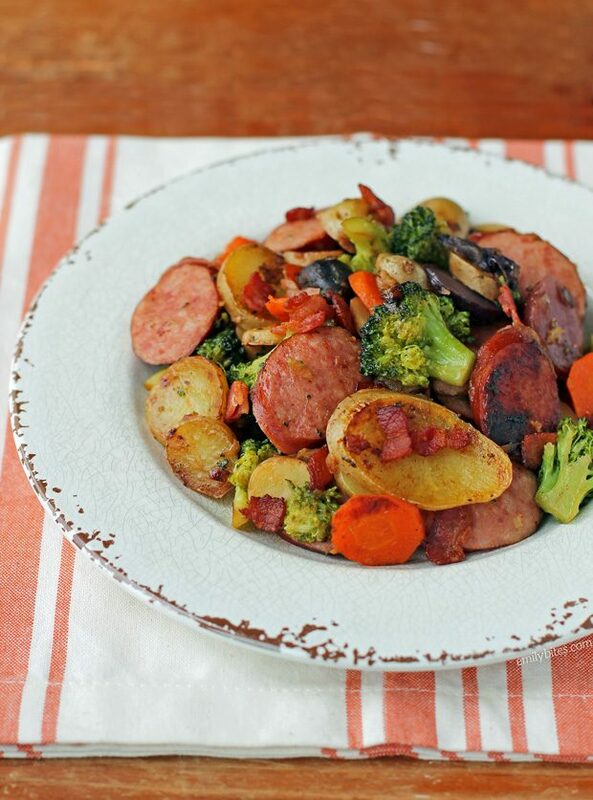 This Rustic Sausage and Potato Skillet is the simple, hearty one-pot meal your family will love year-round. I absolutely love one-pot meals (let’s hear it for less dishes!) and this one is great because the steps really couldn’t be easier. 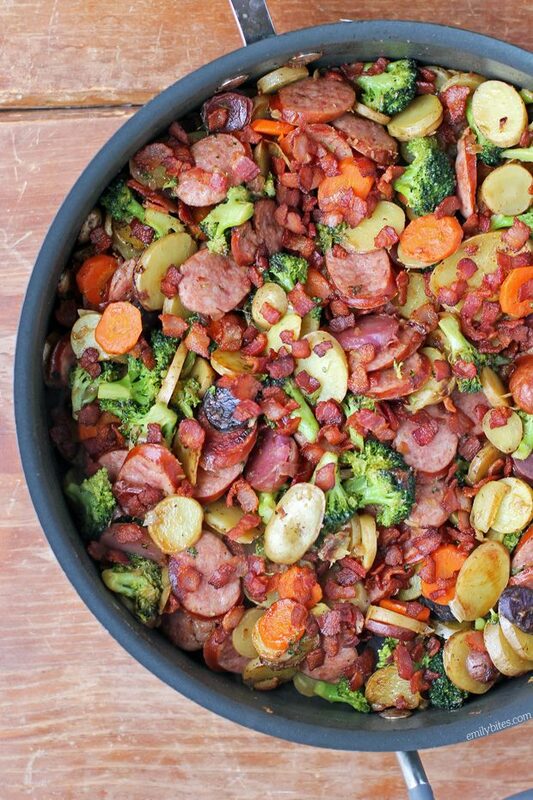 This comforting meal is super filling with great smoky flavor from the bacon and sausage and a little sweetness from the carrots. I used a colorful medley of fingerling potatoes, but you can substitute other potatoes depending on what you have available. You’ll never believe a satisfying serving of this Rustic Sausage and Potato Skillet is just 277 calories or 7 Weight Watchers SmartPoints! Looking for more tasty, lightened up one-pot meals? Check out my recipes for Beefy American Goulash, One-Pot Cincinnati Chili Bake, Sausage and Tortellini Tomato Soup, Chicken Pesto Parmesan Pasta Skillet, Beef Stroganoff, Pumpkin Alfredo Tortellini Skillet, Beef Taco Soup, Cheesy Chicken Veggie Pasta Skillet, Spicy Taco Gnocchi Skillet, Chicken and Chorizo Salsa Skillet, Best Turkey Chili, Sausage Tortellini Skillet, Spaghetti and Meatball Soup, Spicy Sausage Pasta, Broccoli Cheddar Soup, Bacon, Cheddar and Beer Risotto, Barley Beef Skillet and more in the One-Pot category of my recipe index. Place the chopped bacon pieces in a large saute pan or walled skillet and bring to medium-high heat. Cook the bacon, stirring occasionally, until crisp. Using a slotted spoon, remove the bacon pieces to a stack of paper towels to drain. Discard all but one tablespoon of the bacon grease. Return that tablespoon of grease to the pan and add the tablespoon of butter. Reduce the heat to medium and when the butter is melted, add the potatoes, broccoli, carrots and onions. Stir to coat the ingredients and cover the pan. Cook for 10-15 minutes, stirring every 2-3 minutes. Remove the lid and sprinkle with salt and pepper. Add the sliced sausage and stir to combine. Replace the lid and cook for an additional 10 minutes, again stirring every two minutes or so. Sprinkle the bacon pieces over the top and serve. Emily – I just wanted to thank your for such great recipes that are WW friendly. You are making a weight loss journey a lot more enjoyable! Keep up the good work. This came along just in time as we were in a rut with our regular rotation. It appealed to me because it reminded me of a sausage and potato thing my mom used to make when I was a kid, but much better for you. My husband thought he wouldn’t like it because there wasn’t a sauce or cheese or anything but we both found it really tasty and easy to throw together on a week night. Thanks for posting another good one just when we needed it! I was wondering if you could use any kind of potato? Not sure if the stores around me sell fingerling potatoes. I was thinking about using Yukon gold and wondered if that would alter the points on the recipe? You can definitely use a different type of potato. I haven’t calculated the recipe using another kind but I highly doubt the points would change. I hope you love it! Made this for my husband and daughter and we all LOVED it!! 🙂 So simple and fresh and yet SO delicious and decadent. Thanks so much! Excellent! Made this tonight and my boyfriend loved it. It’s on his list of favorites. We love your recipes, especially the au jus wonton cups! Keep up the excellent blog!!!!! This was another winner! Even my picky 3-year-old gobbled it up. I made this dish last night and absolutely LOVED it!! I WILL be making this again! It made a wonderful supper and 4 leftovers for lunches for me and hubby 🙂 The only change I made was I threw in some mushrooms as well. Thank you for this delicious dish! Made this tonight. Delicious. I was thinking of adding mushrooms next time because I love them. I was also thinking that a half portion with a poached egg on top would make a super filling and delicious skillet style breakfast. Can I ask something really stupid? I’ve never cooked bacon in a pan before (I’m lazy and do microwave or oven), so do you not use any oil or butter? Haha, no need for additional fat, the bacon will make its own! This was delicious! My husband and I both loved it. Thank you – this will become a weekly favorite. I absolutely LOVED this. I added some fresh green beans, garlic, and mushrooms and was actually excited about leftovers! My boyfriend has requested to make this again, and wants to add some bell peppers too. Totally digging this website and the recipes. Please keep’m coming! Delicious recipe. Husband approved, we can’t wait for leftovers. Thank you. Just finished this and it was amazing! Will definitely be putting in the rotation! Thanks Emily! Thank you for all the great recipes. They are delicious and weight watcher friendly. None have disappointed. Please keep them coming! I have never left a comment on a recipe before, but this was so good, I just had to! I didn’t have any bacon, so left that out, and this was fantastic even without it. And so quick and easy! Thanks so much! This was a great hit with my guys. I can see why – hearty and meaty (while stealthily healthy.) I was hoping for leftovers but not a chance with them around. The teenager requested that this be added to our meal rotation! High praise. Lucky it’s so easy to make. This is the best recipe I have tried since being on freestyle! Love it! Keep up the good work! This is an amazing recipe. Leftovers will be great for breakfast tomorrow!